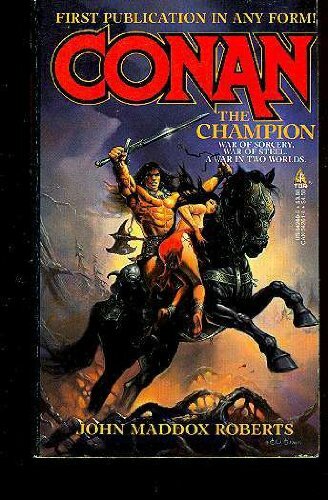 NEXT IN THE CONAN SERIES. 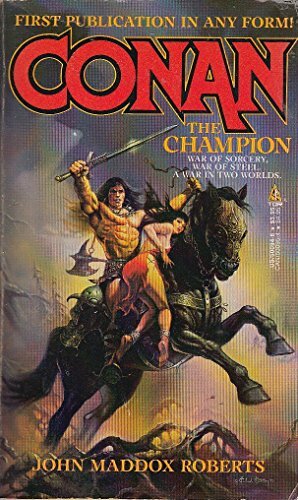 THIS TIME CONAN THE CIMMERIAN IS STRANDED IN THE FURTHEST NORTHERN REACHES OF BRYTHUNIA AND HE PLEDGES HIMSELF AS THE CHAMPION OF THE HAUGHTY, BEAUTIFUL QUEEN ALCUINA. 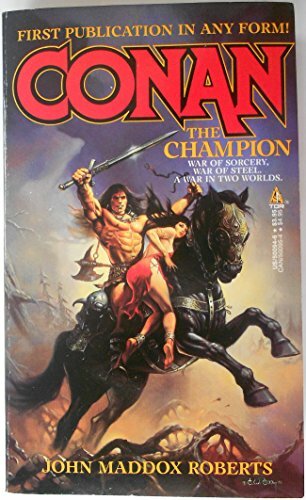 THE MIGHTY BARBARIAN IS ENMESHED IN A WAR WITH TWO KINGS WHO WANT ALCUINA'S LANDS, AND THE EVIL WIZARD IILMA, WHO PLOTS TO RULE THE ENTIRE NORTHLAND AND HAS HIS OWN FOUL DESIGNS ON THE QUEEN'S BODY. 20/06/88 PROD LAUNCH--12000X41PX$2.99(15000X36P). A FORMAT.256PP.OFFSET BUT REMOVE CHRONOLOGY AND OTHER END MATTER.